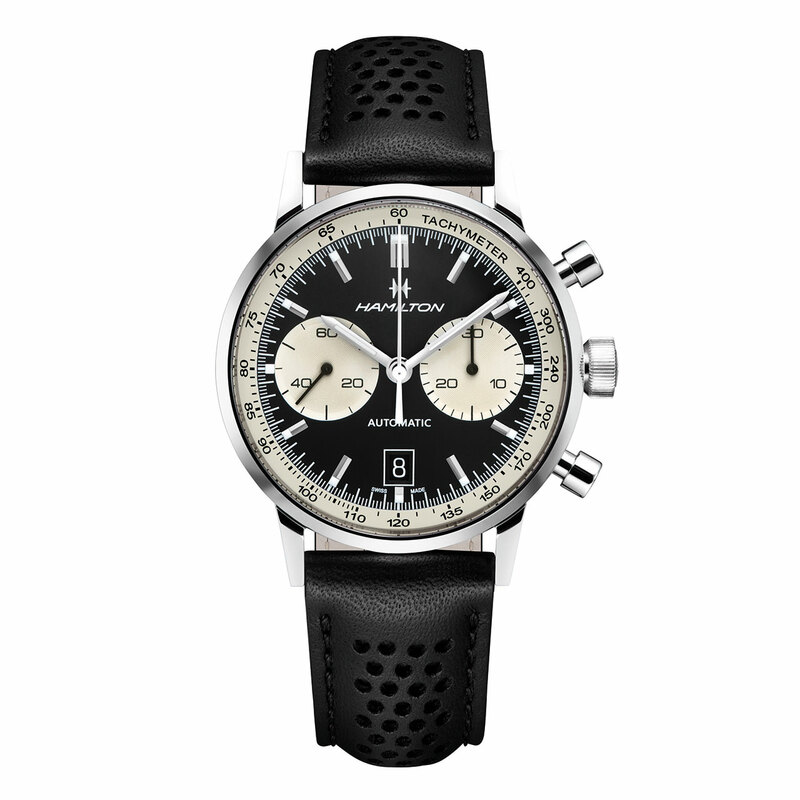 In 1968, Hamilton introduced the Chronograph B that would launch the famous "reverse panda" face with its two white counters on a black dial. Hugely popular in the 1960s and 70s, it is now highly valued by collectors. 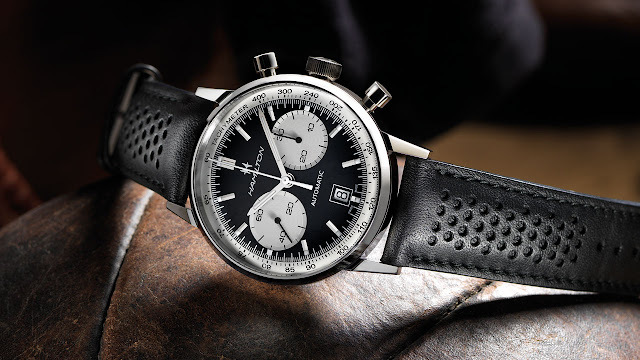 The new Intra-Matic 68 automatic chronograph revives the original design as it reprises the black/white contrast not once but twice: first with the white counters with black hands against a black background, and again with the white chrono seconds hand and black dial, itself circled by a white tachymeter scale. The H-31 automatic movement delivers a 60-hour power reserve, a welcome upgrade, while the case moves up in size to a 42-mm diameter. Rounding it all off, a black perforated leather strap adds to the vintage vibe of this 1,968-piece limited series. Mechanical automatic, H-31 calibre, 60-hour power reserve. Hours, minutes, seconds, chronograph, date, tachymeter. Steel, 42 mm. Anti-reflective sapphire crystal. Water-resistant to 10 bar (100 m/330 ft). Black with white 30-minute counter at 3 o'clock and white small seconds at 9 o'clock. Date window at 6 o'clock. Hour and minute hands coated with superluminova. White chronograph seconds hand, black counter hands. Perforated black leather with buckle.